Well, what do you know? The title of this Forbes story that’s been going around today seemed awfully familiar, and it turns out it’s actually a review, of sorts, of the recent American Antiquity book reviews section on alternative archaeology. The SAA has, in fact, made the entire section open-access. That’s awesome, and if you don’t already have an AmAnt subscription you should go out and download it. It’s definitely worth a read! I don’t, admittedly, always read the reviews section of the SAA‘s flagship journal, American Antiquity. I am, however, quite glad that I did last month (or, more accurately, this month, since I didn’t open the July issue until just a few days ago). That is because the current reviews section is devoted entirely to reviews of “alternative archaeology” titles, in a special reviews section, titled “Talking to the Guy on the Airplane.” These are worth a read for a few reasons. First, many of them are quite funny, especially if you find “alternative archaeology” entertaining anyway, as I do. Second, many of the reviews make important points about why it is that people are much more interested in alternative archaeology than they are in actual archaeology (for lack of a better word). Stephen Lekson’s review, in particular, has some good points about why “all archaeologists not named Brian Fagan” tend to be much less successful than alternative archaeologists at writing for a popular audience. Third, for archaeologists, who often tend to ignore this sort of thing, it’s an interesting overview of what’s actually out there in terms of alternative archaeology. For example, William Conner’s Iron Age America gets a review. I occasionally see him posting to the ARCH-METALS mailing list, and have often wondered what he was all about. Well, now I don’t have to wonder anymore! I do find one thing very strange, though. One of the stated purposes of this special reviews section was to provide laypeople with an overview of what archaeologists actually think of various alternative archaeologies and why we reject those ideas. To quote, “Accordingly, the main intent of these reviews is to offer the silent and curious majority that is interested in these works a professional perspective on them” (Holly 2015: 616). This is, I think, a good goal, especially because, as Holly implies, most of the people who consume alternative archaeology are probably not “true believers.” I’d argue, however, that the best way to engage this audience is not to bury these reviews in a closed-access PDF labeled only “Reviews” that only SAA members can download. This seems to me to miss the point. I should note that Holly has uploaded his introductory piece to his Academia.edu page, but maybe if the goal was to reach a wide audience of non-archaeologists, it would have made more sense to make the entire thing open-access to begin with? Or to make all of them open-access at all? Or to advertise this at all? To be fair, this is not the first time the SAA has done a less-than-stellar job of disseminating information to all of the people who might be interested in it. Still, it’d be nice if they did this time! EDIT: In the course of my Googling on this topic, I’ve discovered that Jennifer Raff already wrote a better post on this a month ago. She’s asked people to pester the SAA about making all of these reviews open-access, but this doesn’t seem to have had much success yet, unfortunately. 2015 Talking to the Guy on the Airplane. American Antiquity 80(3):615-617. I have (as usual?) been remiss in my blogging duties here, and have allowed the August issue of Journal of Field Archaeology (40.4) to come out without blogging about my colleague, Kyle Knabb (et al. )’s, paper in the June issue (40.3). That can’t stand, of course. His paper (long title in the citation below) presents some of the results of a survey he conducted in 2009 in Wadi al-Fayḍ (transcribed al-Feidh in the paper), near Petra in southern Jordan. The focus is primarily on the settlement patterns of this wadi system during the Iron Age and Roman periods. He argues that, during the Iron Age, Wadi al-Fayḍ was settled by people who subsisted on a combination of farming and herding, in contrast to the plateau, where the evidence suggests a “loosely organized agricultural state” (375). During the Roman period, evidence for settlement sites disappears, suggesting that Wadi al-Fayḍ essentially became the agricultural hinterland of more concentrated settlement in and around Petra. The really interesting part of the paper, though, is that I was, in fact, a member of the Wadi Feid Expedition (WFE) survey team way back in 2009. Actually, now that I think about it, the WFE was the first archaeology project I was involved with in Jordan (followed very shortly by the excavation at Khirbat al-Nuḥās that same year). Should you read this paper, there is actually a photo of me rappelling down a waterfall on page 372 (why yes, I’m wearing a previous pair of Merrell Moabs, although you can’t really tell). If you’re reading it for the photos of me, though, I should point out that the previously linked National Geographic site is a rather better source of those. Incidentally, Kyle and I (with a few others) are currently preparing something of a sequel to this paper, which will focus on the settlement patterns in Wadi al-Fayḍ during the Middle and Late Islamic periods. Stay tuned for more. A little while back (a few months ago now, actually), I was back in Faynan for two weeks of archaeological survey. The project was, unfortunately, right in the middle of the UCSD Spring quarter, but it was small and fun, and we found some interesting things. I’ll leave it to my girlfriend to describe those at some point, though, as it was her project, and we were mostly looking for prehistoric sites, which isn’t exactly what I do, as occasional readers will have noted. I’m writing about it because, on this trip, I destroyed another pair of boots. There they are, on the floor in my room at ACOR, looking the way most archaeologists feel when they get back to ACOR after a field season. 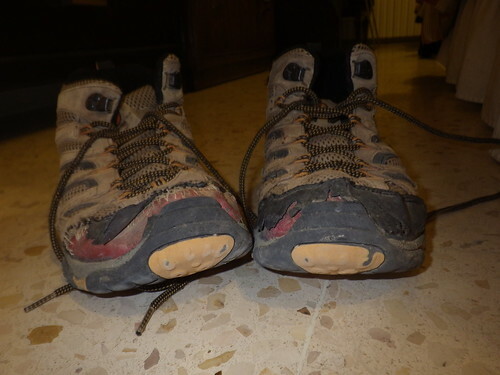 This was my second pair of Merrell Moabs. On the one hand, I really like these boots. They’re comfortable, they breathe well, and they provide enough ankle-support to survey fairly rocky terrain. Also, they tend to be easy to find on sale, which is nice if you’re super cheap a grad student. On the other, I’m beginning to think they might not be my best choice in the future. Sure, survey is pretty rough on boots, but you’d think a pair of $100+ boots could stand up to more than two field seasons. . .
Also, I noticed as I was about to post this that Bill Caraher has recently posted about his own boot woes. To be fair, had I posted this when I intended, I would have beaten him by a few months! I realized earlier this week, as often happens around this time of year, that the SAA Annual Meeting is less than two weeks away. I should really be writing the rest of my talk right now, but rather than do that, I’m going to procrastinate by writing about the talk here, instead. The conference is in San Francisco this year, which is a bit mundane compared to the past two I’ve attended — Honolulu and Austin — but, combined with the fact that last year’s ASOR meeting was in San Diego, does make my conference travel this academic year relatively easy. I already have more entirely archaeological activities lined up than I’d probably be able to do even if I weren’t attending a conference, so it should be a successful SAA trip, even if it isn’t Hawaii. I gave my paper this year a deliberately vague title, in order to try to avoid being put into an “Archaeology of Jordan”-type session. I was moderately successful there, but at a rather large price. I’m instead in the “Studies of Technology, Ecology, and Craft Production in South, Central, and Western Asia” session, which is still a catch-all session, but at least with something of an interesting theme compared to “Archaeology of Jordan.” I’d say that I hope the crowd will be bigger, too, but I don’t expect to be speaking to anyone but the other people in the session for this one. I have the good fortune of giving the 8 AM presentation on Sunday morning, which I suspect is the least-attended time slot of the entire conference. Ah, well, you can’t win them all. Plus, my good friend and colleague Aaron Gidding is presenting in the same session, so it’s not all bad. The talk itself is a review of what we currently know about the hand-made ceramic traditions of the Middle and Late Islamic periods, focusing primarily on a long-lived group called the Hand-Made Geometrically-Painted Wares, or HMGPW for short. Rather than looking exclusively at material from Jordan, I’ve tried to put together a somewhat impressionistic picture of the distribution of this ware (and related wares), which is surprisingly broad. You’ll, of course, have to show up at 8 AM to hear more. Following tradition, here’s the abstract for the talk. This paper argues against a common view of medieval Levantine villages as isolated from larger regional centers by examining a group of hand-made ceramics — commonly called Hand-Made Geometrically Painted Wares (HMGPW), and formerly “pseudo-prehistoric” wares — prevalent across the Levant from the 12th-17th centuries AD, and possibly longer. They are generally seen as the products of non-specialist village potters and, as the older name suggests, an example of technological decline. That view, though, is based primarily on ethnographic evidence from the late 19th and 20th century Levant, and hinges on a number of assumed, and generally unquestioned, dichotomies: urban/rural, specialist/non-specialist, wheel-made/hand-made. As HMGPW is the most visible indicator of settlement during these periods in the southern Levant, these assumptions have influenced the ways archaeologists conceive of rural Levantine economies, leading to a view of villages as disconnected from larger centers where higher-quality, wheel-made pots were produced. This view, however, is at odds with historical evidence for substantial state investment in rural agriculture. In this paper, I present a broader approach to HMGPW — integrating archaeological and ethnoarchaeological insights from beyond the Levant — that helps us better understand what the widespread adoption and longevity of this “retrogressive” technology says about rural economies. I got word a few days ago that a book featuring a chapter on Islamic period Faynan (and southern Jordan, more generally) has just been printed. As you might guess, I’m the lead author on that chapter (with Mohammad Najjar and my advisor, Tom Levy), and I’m excited to see it appear in print. The book, published by Cambridge Scholars and edited by Scott Stull, is From West to East: Current Approaches to Medieval Archaeology, which developed out of the first Conference on Medieval Archaeology. The conference itself was a great experience — and although I couldn’t make the second one last year, I hope it continues — and the book reflects this. It’s a nice survey of the current state of medieval archaeology, and the coverage is fairly broad. Ours is the easternmost (and southernmost) of the contributions, many of which, perhaps unsurprisingly, focus on the U.K., but there are several on Anatolia, as well, so we’re not alone in the eastern Mediterranean. Our chapter — titled “‘Not Found in the Order of History’: Toward a ‘Medieval’ Archaeology of Southern Jordan” (catchy, no?) — builds on the relationship between copper and sugar production that we’ve previously proposed and places this in a longer-scale analysis of the economy of the ‘Araba, from the decline of Petra and a shift to an “Arabia-facing” economy in the Early Islamic period, to the decline of this system and the shift to a “Syria-facing” economy in the Middle Islamic. This is also the first publication, I believe, where we address the Late Antique and Early Islamic period material from our excavations at Khirbat Faynan, which I also covered in my most recent ASOR talk. This is, of course, very preliminary, considering that I gave the talk on which this chapter is based in 2013, but it’s still quite exciting. Beyond this, we also try to connect the archaeology of southern Jordan to “medieval archaeology,” by which people normally mean the medieval archaeology of Europe. We’re not the first people to try to make this connection, but it does open up some interesting possibilities for thinking about the roles that a tiny copper mining village out in the desert might play. The title itself, “Not Found in the Order of History,” is taken from an Exodus itinerary reproduced in several medieval pilgrimage guides (in this case, the 12th century guidebook commonly, but incorrectly, attributed to “Fetellus”), which describes Faynan (or Fynon [Punon, really, I suppose]) in these terms. This account, in turn, is based on a letter of Jerome, who actually had rather more than this to say about Faynan. I discuss this account in more detail in my dissertation and an upcoming publication, but here it serves as a nice shorthand for the problems of doing “medieval archaeology” in southern Jordan. Medieval archaeology and Islamic archaeology are generally thought of as “historical archaeology” (in the broad sense of archaeology informed by history, rather than the narrow sense of “the archaeology of capitalism”). Southern Jordan, though — and Faynan in particular — is, for the most part, absent from the historical sources of this period. What does it mean to do historical archaeology in a place “not found in the order of history”? It’s a difficult question to resolve, but we try here. Last year I received a grant from the Palestine Exploration Fund to analyze the rather large amounts of charcoal our project has found at the Islamic period copper smelting sites we’ve excavated, primarily Khirbat Nuqayb al-Asaymir and Khirbat Faynan. I’ve been meaning, for quite a while now, to write up a post for the PEF Blog — which is, incidentally, always an interesting read — with some updates on what we’ve learned so far about charcoal provisioning in Faynan. I’ve actually, finally, managed to do that, and there’s now a short post on the PEF Blog summarizing our preliminary results and (tentative) conclusions. You should go check it out!